The KDF Shower Water Filter contains the most effective media there is to remove chlorine in high temperature shower water – patented KDF 55 copper-zinc alloy. KDF media actually becomes more effective in higher temperatures (such as in a hot shower) but this is not the case with other filters such as those containing carbon – theirs becomes less effective! WHAT’S SO BAD ABOUT CHLORINE? Chlorine dries out the natural protective oils found in your skin and hair. That’s why a long swim in a chlorinated pool dries your skin and damages your hair. Chlorine vaporizes quickly in a hot shower, so you end up breathing chlorine gas. This isn’t good for anyone, but chlorine can have a major impact on people with asthma. Prove it for yourself: run a hot shower in an enclosed bathroom for 5 minutes then check for the chemical smell. That’s chlorine. Chlorine is universally used to disinfect water, killing bacteria and other microorganisms. But once it arrives in your home, chlorine can negatively affect your family’s long term health, comfort, and even personal appearance. Effectively removes up to 95-99% of chlorine and up to 98% of inorganic water-soluble heavy metals such as lead, mercury, nickel and chromium. Also controls the buildup of microorganisms such as bacteria, algae, fungi and mold. A unique feature of the KDF filter is the reminder ring. When you install it, you simply rotate the blue calendar ring to line up with the current month. This will help you to remember to replace the filter the following year to ensure you’re getting the best quality water possible! Check out our Blog page. 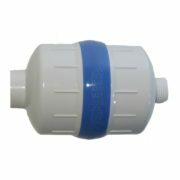 Does a shower water “filter” really soften water? The KDF Shower Water Filter can be installed in-line with the ShowerStick, Portable RV Water Softener or The Mini WaterSticks or it can be installed by itself in a shower. It installs in minutes with no tools on any shower pipe with standard 1/2? pipe threads. To install by itself in a shower, simply unscrew your shower head from the shower pipe, attach the KDF filter to the shower pipe then add your shower head. The KDF filter should be replaced yearly if 2 people are using the shower (or sooner if you smell the presence of chlorine).